So apparently a year ago there was this teeny tiny royal wedding. Not sure if any of you heard about it. Probably not, which is good because it means this only slightly late post will be all kinds of fresh. While most of my peers chose to either ignore the wedding or watch it at home, myself and @markb0ss decided to head into central London to see what we could see. By the time I got to Trafalgar Square they’d stopped letting people in and the area around St Martin in the Field was also getting quite full. Off towards the Mall and meeting Mark it was then. En route the lack of people was eery. Zombie apocalypse eery. After a slight diversion down Haymarket where we watched a crowd watching a bar’s TVs (showing the wedding) from the street we found ourselves along Pall Mall and ultimately on the (very) far side of the gates looking down on the eventual parade route back to Buckingham Palace. During the wait I thought despite being back in the crowd I’d be ok when the procession went past as I could see over their heads. Sadly when it did go by everyone got on their toes putting up their cameras/phones blocking out any viable view. And of course I did the same. Sheep that I am. I took pictures on the vague hope that I’d see something after the fact. I did not. Maybe a gleam of a helmet. Although there were even more people behind us! 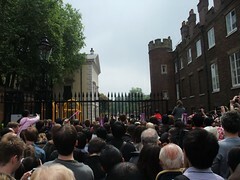 After even more of a wait the gates opened and we proceeded onto the Mall and got all the way to Buckingham Palace. Unfortunately we were behind the fountain and a broadcasting tower so couldn’t see the balcony. Instead relying on the wave of cheers from either side to let us know. So, hours of waiting and not seeing anything, was it worth it? Yes. It was a great atmosphere (and excellent weather), while there were a few idiots the majority of people were friendly and it was a pleasant time. Even after the wedding the streets of London were quiet and later while resting everyone was chatting about the day. It was almost as though London’s usual gruff attitude had gone into the mirror universe. Having said that, now that I’ve done one I wouldn’t necessarily rush to another. Not to mention, having good mates to watch it with helps as well! Photos (camera phone) on Flickr!